This post was written by Dr. Leonard Fox, a chiropractor who runs Georgetown Chiropractic in Georgetown, Connecticut. You may not realize it, but one of the greatest health hazards small business owners and their employees face is sitting in front of a computer for long stretches of time. Indeed, contrary to popular belief, a “desk job” is far from a “cushy job” – and can result in excruciating neck and back pain, headaches, eye strain, leg numbness, and arm, wrist, and hand pain. Or worse. Fortunately, there are some simple steps you can take to prevent or at least minimize these problems. And if years of sitting and working have already caused you harm, the simple steps outlined below will help minimize the effects of sitting in front of your computer and improve your quality of life. Good ergonomics is crucial. 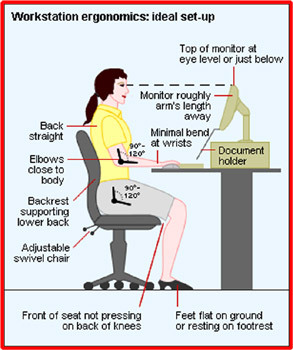 Simply put, this means your workstation (computer + monitor + chair) must be set up in a way that minimizes physical strain. Have a good office chair. Good office chairs (such as the Herman Miller Aeron chair) allow the back support part of the chair to come forward and lock into position, so that you can sit comfortably, with your back firmly supported by the back of the chair. This minimizes lower and mid-back strain. Your monitor and keyboard should be directly in front of you, with the top third of the screen at eye level. Looking up or down to see the screen is a major cause of neck pain and headaches. So you need to set the height of your chair so that with the arms are comfortably at your side and your elbows are at a 90-degree angle when using the keyboard and mouse. While seated at this height, your feet should be planted firmly on the floor, not tucked under you or the chair. If you are short enough that this is not possible, use a a foot rest, which can be as low tech as an old telephone book. Just make sure your knees are slightly lower than your hips. Take frequent mini breaks where you get up, stretch, and walk around. SittingSafe, the ergonomic training program I teach and heartily endorse, recommends a system of mini breaks throughout the day. As scientists have proved, a 10-second stretch break every 10 minutes or a 20-second break every 20 minutes can mean the difference between a productive, happy, pain-free worker and a cranky, sleepy, in-pain worker one bad day away from a costly work injury. While there are specific recommended movements, the key point is to force yourself to briefly stop working and move what feels tight. Your eyes, neck, shoulders, arms, wrists, back, and legs are all accumulating stress as you sit. Movement will allow that stress to dissipate before it can cause you harm. NOTE: While these tips seem obvious, in my many years of inspecting people’s work stations, I have seen many set up so that comfortable sitting and working is impossible. Above all, keep in mind: No matter how perfectly you set up your work station, and how tall and straight and lovely you look sitting and working, no posture is good for long. The sad truth is that human beings were just not designed to sit in one position for long periods of time. Our bodies are meant to move. And while you can force yourself to sit and work for hours at a time, your body will suffer for it in the end. But if you follow my four simple tips, you will be able to significantly minimize and prevent injury. Good points all. I find that I don’t get up enough, so this is a good reminder. Thanks for this post. I have problems with neck and back pain. I’m an accountant and author so I sit at a computer a good bit of the time. I will use these points and see how it goes.